We were shopping after church at Aldi's today. As usual we bought more than we had boxes for. My husband grabbed two paper bags and placed them on the conveyer belt. At that moment, I flashed back in time. As a child, I remember going to William's grocery store with my mom in December. My little girl eyes sparkled when I watched the bagger place bread and milk in brown paper bags stamped with Merry Christmas, and the baby in the manger, Santa, or a Christmas tree. 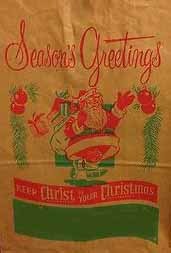 Those simple brown paper bags, printed with an offset holiday design, ushered in the beginning of the Christmas season. I knew they'd be filled with chocolate chips, marshmallow cream and butter for my mom's fudge. Candy canes and the smell of popcorn would soon fill our home. Just the sight of them brought joy to this little girl's heart. The magic of the season had begun. That moment of memory reminded me of the childlike joy I love at Christmas. Amidst the hustle and bustle, I want to keep my eye out for the simplest touches of the season. The ones that remind to keep a smile on my face. 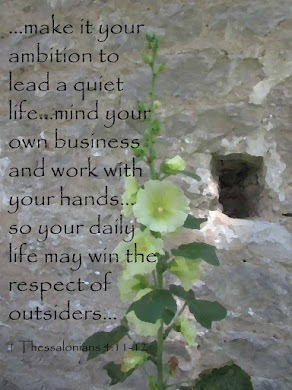 I love finding the beauty in every day things. What simple Christmas memories do you have? Caroling with my church, the old Christmas record, the Santa Claus driving a car, and garland everywhere. Yummy Christmas cookies! Christmas caroling was great fun for me, too.